The Nature of Grace: Homeschool Theme of the Week: Penguins & Polar Bears! Homeschool Theme of the Week: Penguins & Polar Bears! Miss A made a penguin from a cardboard container in the kitchen. 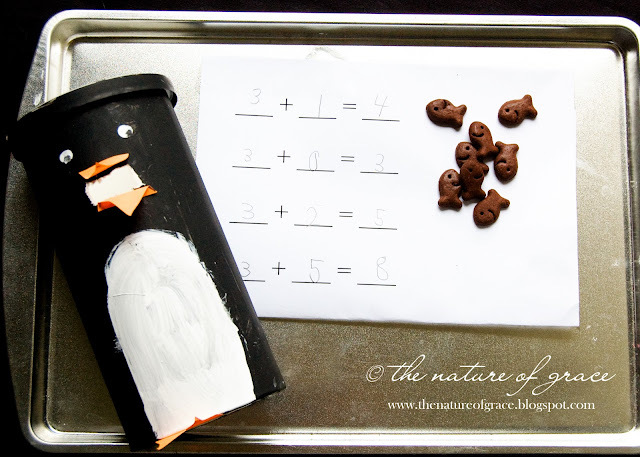 I poked a hole in it for the mouth, and she fed it fish based on the numbers from her addition facts. 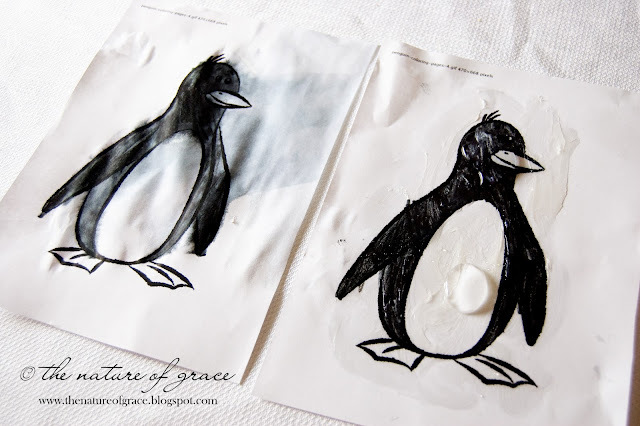 For this activity, Miss A colored two penguin pictures I had printed out. 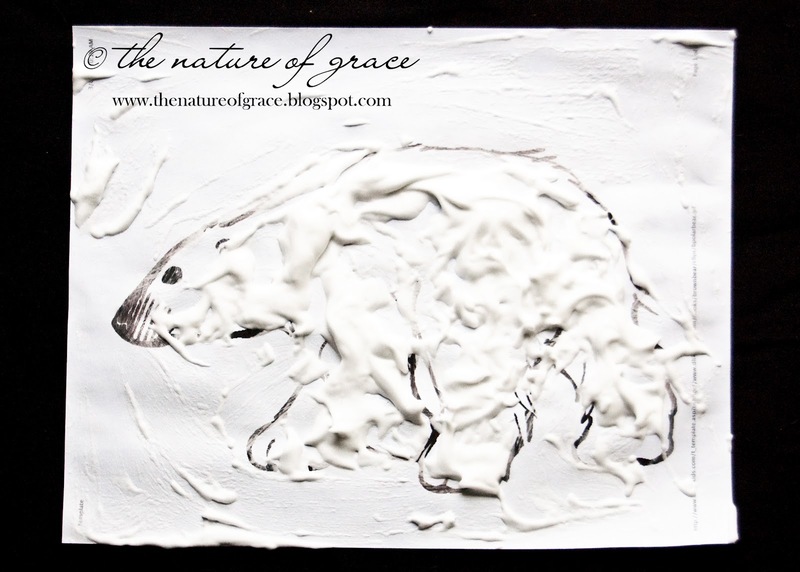 I left one untouched and covered one with a layer of vaseline in order to illustrate how a penguin's feathers work to keep it from getting terribly wet and cold. Miss A had fun discovering what happened when water was poured on each. Uh-oh! 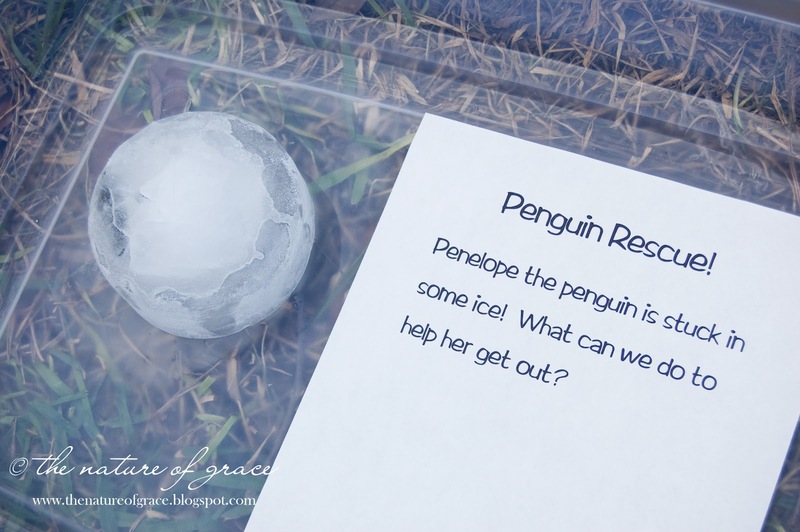 Penelope Penguin found herself encased in a block of ice recently! Miss A had a great time figuring out the best way to free her. This was a great problem-solving exercise, and I was pleased with Miss A's suggestions (which we tried). The one that worked best was to use the hose to pour water on it and watch as the ice quickly melted, and Penelope was free at last! For anyone with a Cinderella loving daughter - this is a fun version of that much loved classic! 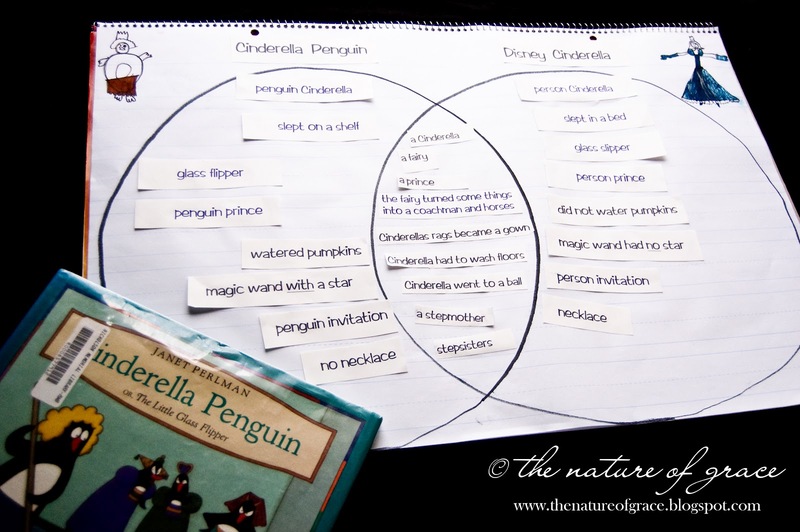 We used a giant Venn diagram to compare the Disney version of Cinderella with Cinderella Penguin. LOVED this cute idea and had to include it in our week! 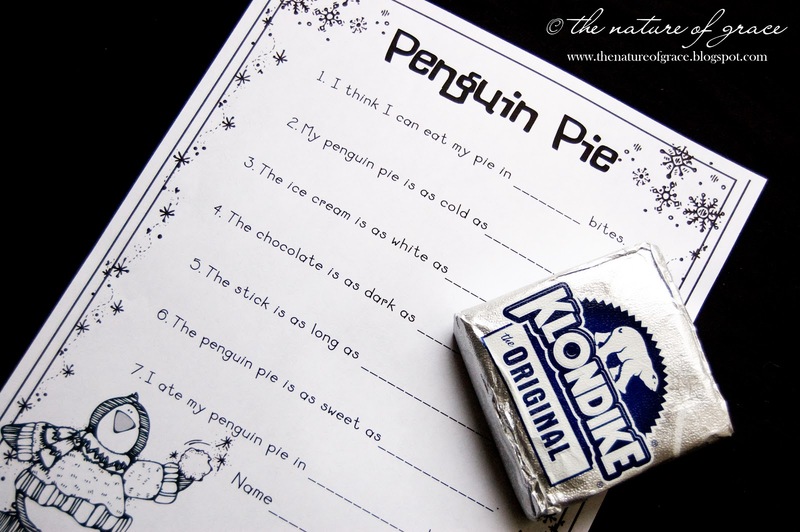 Here is where you can print out your own copy of Penguin Pie! We helped penguins populate an iceberg today - well, not real ones. But as you can see - still pretty adorable! 1. 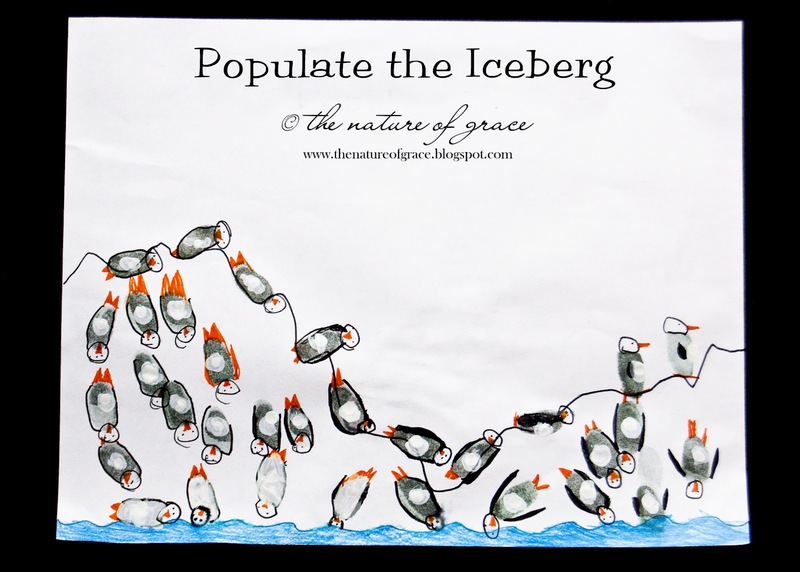 Draw an iceberg on a piece of paper. 3. Keep going until you have filled it up! 4. Add the fun details (eyes, tummies, etc.)! ICE PLAY! 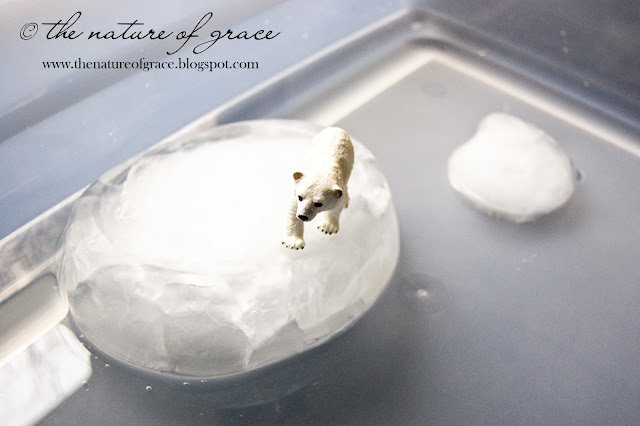 Simply freeze water in different sized containers to make icebergs and set them afloat in a tub of water. Add miniature plastic animals and PLAY! Found this idea on Pinterest which led me here. I purchased a baby polar bear figurine from our local Michael's store and a Toob of ocean animals which contained a penguin. I have posted links below to some other great Toobs for those who might be interested in obtaining more penguins or an entire bunch of arctic animals. 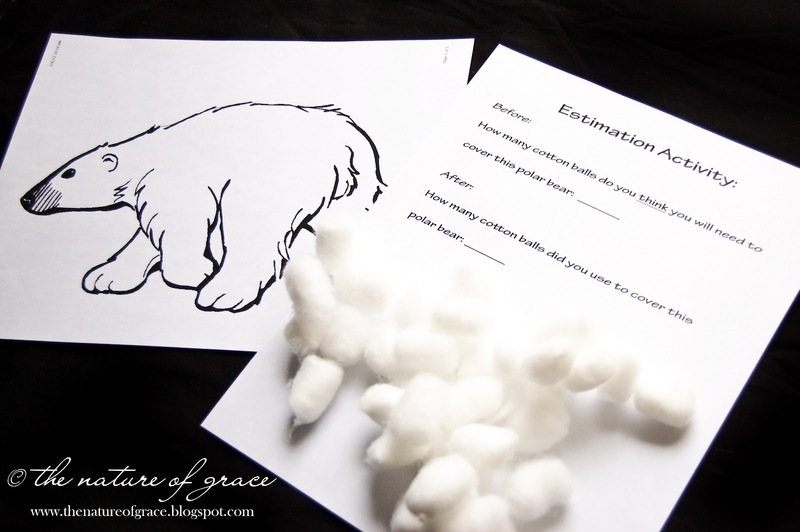 Oh I wish I had these ideas a few weeks ago (when we did penguins and polar bears!) These are AMAZING! I am your newest follower and have voted for you too! Thank you for sharing all these ideas with us at the Kids Co-op. I love all the maths play ideas. Very cute! I'm saving some of these ideas for when we get around ot letter P again next year! So much fun! I would love to come be a student at your house! Oh my goodness!! So cute!! What awesome ideas!! I HAVE to try a few of them!! Wow what a fantastic unit study! I love the Cinderella Venn diagram comparison. The penguin rescue is also very cute! Thank you for linking up this week to my Enchanted Thursdays Blog Hop! Wow I love everything you did with this theme!! Thank you so much for linking up to stART this week at A Mommy's Adventures! Wonderful ideas! I am going to bookmark this page for when we do a until on penguins and polar bears. Some great ideas that can be adapted to other units as well! Awesome! So many great ideas! Thank you so much for sharing at Mom On Timeout! 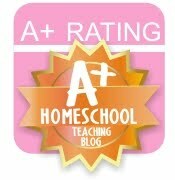 Homeschool Theme of the Week: Spring! A Friendly Friday - Sneaky Shamrocks! Mommy and Me Activity - Fairy Shoes! 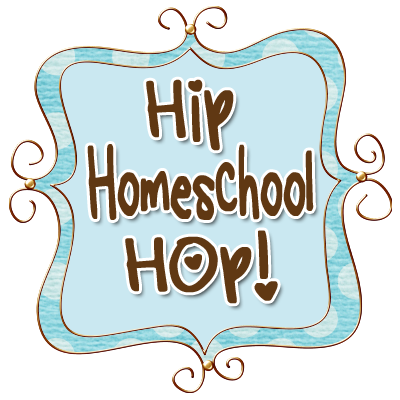 Homeschool Theme of the Week: St. Patrick's Day! Homeschool Theme of the Day: Dr. Seuss!